Financial Forecasting, Analysis and Modelling provides a complete framework of long-term financial forecasts in a practical and accessible way, helping finance professionals include uncertainty in their planning and budgeting process. With thorough coverage of financial statement simulation models and clear, concise implementation instruction, this book guides readers step-by-step through the entire projection plan development process. Readers learn the tools, techniques, and special considerations that increase accuracy and smooth the workflow, and develop a more robust analysis process that improves financial strategy. The companion website provides a complete operational model that can be customised to develop financial projections or a range of other key financial measures, giving readers an immediately-applicable tool to facilitate effective decision-making. In the aftermath of the recent financial crisis, the need for experienced financial modelling professionals has steadily increased as organisations rush to adjust to economic volatility and uncertainty. This book provides the deeper level of understanding needed to develop stronger financial planning, with techniques tailored to real-life situations. Risk plays a larger role in financial planning than ever before, and possible outcomes must be measured before decisions are made. Uncertainty has become a critical component in financial planning, and accuracy demands it be used appropriately. With special focus on uncertainty in modelling and planning, Financial Forecasting, Analysis and Modelling is a comprehensive guide to the mechanics of modern finance. 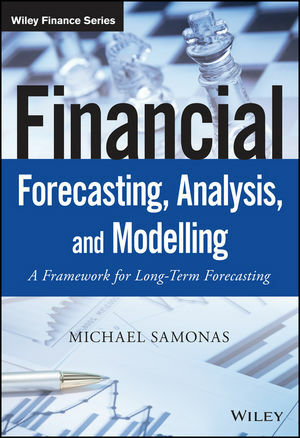 MICHAEL SAMONAS is a finance professional with extensive experience in Financial Planning, Analysis and Modelling. He is currently the Group CFO of SIDMA S.A, a member of Viohalco Group of companies. He has worked in the past for various multinationals including Vodafone S.A. and Hellenic Telecommunications Organization conducting a range of models for business planning, valuations, mergers, projects and data analysis. For a number of years Michael was instructor at the School of Business & Economics of the University of Laverne, Athens Campus.